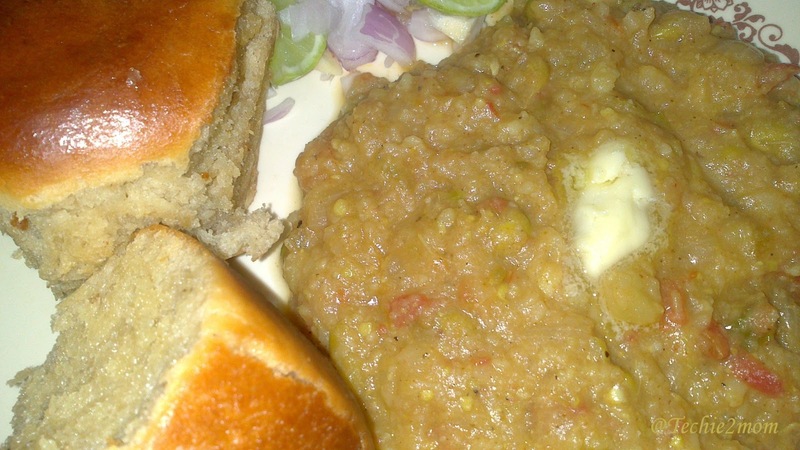 And once we shifted to Noida, i started baking Pao also as the Pao here are a bit too sweet for our taste..So i make Bhaji pao from scratch!!! 1) Boil Potatoes, Peas, Cauliflower and cabbage together in pressure cooker. 2) Meanwhile in a big pan take oil, add onions and ginger garlic paste and saute on medium flame till they turn a little brown. 3) Now add Capsicum to the pan and saute till it gets cooked. 4) Now add tomatoes to that, keep mixing till tomatoes are cooked and squishy. 5) Add Red chili powder, turmeric, Garam masala and bhaji pao masala. 6) Mix well and keep cooking on medium flame for 5 minutes or till oil separates. 9) Add these crushed veggies to the pan along with the stored water, mix well and let it simmer on low flame for 20-30 minutes. 10) Add the butter & raw onion and serve hot along with Pao/Paratha/Bread, finely cut oninons and lemon wedges. 2) You can also add halved Kajus, for that fry them along with onions. 3) If you like cheese then you can make cheese bhaji by sprinkling grated cheese on the top. 4) To reiterate, if you like the colour red then skip turmeric. Previous Post: Baking for Beginners…. Next Post: Color me black….